When I was a young wife, my new husband and I spent some time staying with a couple who were about ten years our senior, and who were into eating healthy. The wife spent a lot of time making homemade meals that were usually tasty as well as healthy. One thing I noticed is that the baked products, especially the breads she made, were very dense and heavy. One day, I was visiting with her as she busily mixed the ingredients for a batch of bread. It was then that I observed that when she measured out the flour into the bowl, she used the cup like a scoop, pulling it through the flour canister until it was full and then dumping it in the mixing bowl. Remembering my high school home economics classes, I realized why her baked products tended to be so dense. More recently, I gave a bread recipe to a friend and she reported back that the resulting bread tasted good but was on the heavy or dense side. Thinking of my earlier experience, I asked her to describe how she measured her flour, and--you guessed it--she also used her measuring cup to scoop it out of the flour canister. Do you know how to measure flour correctly? This may sound silly to you but, believe it or not, the quality of your baked goods will be affected by how you measure your flour. Recipes, especially baking recipes, are based on a standardized way to measure flour called the "dipping" method. The way this works is that you dip a scoop or spoon into your canister of flour and then pour it into your measuring cup until it is slightly overflowing. Then, use the edge of a knife or spatula across the top of the cup to scrape off the excess and get an exact amount. This is important, because flour is light and packs easily. If you scoop using the measuring cup, the flour will pack into the cup and your baked product will be heavier than intended by the recipe. 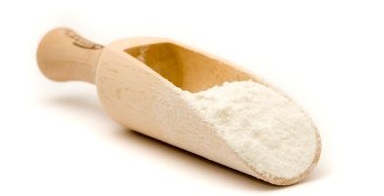 Why is it important to measure flour correctly? Although, home baking is becoming a lost art, it is important to learn proper techniques, so that when you do take the time to make it from scratch, your finished product will be worth the effort. Baking is really more like science than art, since the amount and proportion of ingredients must be carefully balanced to bring about the best result. By standardizing the measuring technique, recipes can be exchanged with the expectation of a uniform result. Should I have told her? I was so young then, that I didn’t feel comfortable pointing out to this older, experienced woman what I had observed. I really appreciated that she took the time to prepare healthy and nutritious meals and didn't want to risk offending her. Since then, we have lost touch with this couple, but perhaps someone else gave her the information about how to measure flour correctly. I hope so! Click on the links below for more Healthy Eating Tips. Click here to go from Measure Flour Correctly page to Healthy Grains page.